On a rainy Sunday I arranged to meet Liz Caskey for lunch at her loft in Barrio Brasil, an old neighborhood now sprucing up with smart coffee shops and restaurants. A young Pennsylvanian, Liz has resettled in Santiago. 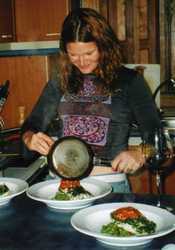 She is a gifted cook and has drifted from banking into leading culinary tours. After meeting at a subway stop, we walked through atmospheric old streets where English Tudor, Spanish and Moorish buildings, some more than a century old, stand side by side. The oddest was a Tyrolean castle that had been the headquarters of a popular soccer team, Colo Colo.
Liz’s loft is on the second floor of a 1920s building in a part of the barrio known as Barrio Yungay. Before going there, we shopped for lunch ingredients at a feria libre, an open-air farmers market. Chileans use only freshly harvested produce rather than importing fruits and vegetables out of season. Oranges were just coming into the market, brightening the gloomy day with their brilliant color. Gorgeous artichokes and asparagus, delicate, small red lettuce heads, avocados and the first of the season’s strawberries were irresistible. Liz bought bundles of mixed herbs that included celery leaves, cilantro, parsley, oregano and mint as well as lemons, fava beans, peas in the pod and many other things. I bought the last of a spice vendor’s supply of merquen, a smoked red pepper seasoning from southern Chile that has become trendy, and packets of an all-purpose ground herb mixture known as alino. Loaded with sacks, we climbed to Liz’s loft and set to work. Usually I was alone on my tours. This time I was joined by Tod Mostero, a Californian who moved to Chile to become winemaker at the prestigious Almaviva winery, a joint venture between Concha y Toro and the House of Rothschild. Tod and I peeled fava beans and shelled peas while Liz brought us puff pastry empanadas filled with herbed goat cheese. She also whipped up pisco sours flavored with fresh ginger. The peas went into a beautiful fresh soup garnished with mint and strands of thick cream. We drank a Tamaya blend of Viognier, Chardonnay and Sauvignon Blanc with this course. Liz sauteed the favas with smoked chorizo from southern Chile to make the base for herb-crusted white fish. She seasoned the fish with Dijon mustard, merquen and the herbs she had bought at the market, then seared and baked it. A spoonful of tomato vinaigrette and strands of Dijon and balsamic vinegar added to the complex blend of flavors. The wine for this course was a Botalcura reserve Merlot. We finished with a handsome cherimoya-ricotta cheesecake that Liz had made previously and cups of rich-tasting espresso from Brazil. As Liz cooked, I wrote down each step so that someday I can copy her dishes. I even bought the brand of pisco that she used in order to duplicate her pisco sours. The brand is Los Artesanos del Cochiguaz Pisco Especial, which comes from the Elqui Valley, an agrigultural center some 300 miles north of Santiago. The pisco sour is the favorite aperitif in both Peru and Chile. There is a heated dispute between the two countries over which originated pisco, the grape-based spirit used in the drink. But that’s another story, for another trip. 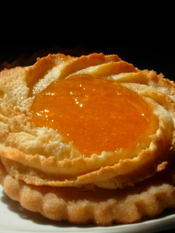 For information on Liz Caskey’s culinary tours, go to www.lizcaskey.com or email to info@lizcaskey.com. In Santiago, I stayed at Marilu’s Bed and Breakfast in Providencia, an area convenient to restaurants, markets, shops and the subway. It was quiet and comfortable there and so homey that a hot water bottle was tucked into my bed every night. Technically, breakfast was the only meal to which I was entitled, and it was a good one, composed of fresh rolls from a nearby bakery, assorted jams, manjar (dulce de leche), cereals, cookies, yogurt, cheese, juice, tea and coffee. But often I joined Marilu Cerda and her husband, Miguel Galarce, for dinner. A woman named Pina came once a week to prepare enough food for several days. She would fill the refrigerator with delicious dishes such as razor clam lasagna, chicken with mushrooms and bean sprouts, mussel salad, beet salad and chupe de jibia, a casserole prepared with an enormous sea creature that is plentiful along the Chilean coast. The large white slabs of firm-textured jibia reminded me of squid, but I’ve seen it defined as cuttlefish. Sometimes I would bring back empanadas, cookies and fruit for dinner. Once Marilu drove to the coast and returned with delicious avocados. Often we shared a bottle of Santa Emiliana Cabernet Sauvignon, the household favorite. Or I contributed a bottle from my wine tours, such as a Santa Carolina Cabernet Rose or a Santa Rita Merlot. One morning when Pina was due, I accompanied Marilu to Lider Megamercado, a huge supermarket where seafood was spread out on iced counters and attendants offered tastes of European-style cheeses made in Chile. While Marilu picked up ingredients from Pina’s list, I bought cherimoya cookies and a cup of lucuma pudding. Chileans dote on lucuma, a round green fruit with bright orange flesh that tastes a little like an American yam. Unpalatable when raw, it makes sumptuous puddings, ice creams and cakes. Along with pasta, seafood, vegetables and other staples, Marilu bought a white cheese called quesillo, which is as soft as a gelatin dessert. She set out quesillo for breakfast, but Pina sliced it onto a salad of lettuce, mushrooms, olives, sweet peppers and sliced eggs. It had rained the night before, and behind the tall buildings of the financial district, the Andes loomed thick with snow. Sparkling clear days were rare during my stay, and by the time we left the market, clouds had covered the peaks. I didn’t see them again until the evening I left for the airport, when the last rosy reflections of sunset made them even more beautiful. Santiago is one place that made me feel at home, literally. Thanks to enterprising tour organizers, I was able to visit private homes there and eat delicious home-cooked meals even though I didn’t know a soul. During a two-week vacation, I spent more time eating with the locals than in restaurants, and I tasted dishes so pleasing that I begged for recipes so that I could reproduce them at home. Instead of the usual perfunctory visits to museums and historic buildings, I started with a tour to Penalolen, a blue collar neighborhood far off the tourist track. In one of the modest homes there, I sipped red wine and ate empanadas stuffed with beef, onion, olives and hardboiled eggs. My hostesses were Maria Espindola and her sister Lya, both in their 80s. Their kitchen was so tiny I could barely squeeze through, but the house was as neat as could be, and roses bloomed in the small front garden. In honor of my visit, the sisters played a recording of vintage American pop songs. Glaucoma has robbed Maria of most of her vision, but she can manage simple household tasks and chats cheerfully, dim eyes sparkling. Never mind that mismanaged pension funds have left her barely enough to live on. My guide, Hilda Cerda, next took me to Vitacura, a neighborhood of elegant homes and condos. There we had lunch with her sister, Pilar Cerda Espindola, who goes by the nickname Oty. Both are divorced, a difficult state for women because divorce was legalized only recently in Chile. Hilda earns money by conducting innovative tours. Oty cooks for tourists in addition to working full time as an insurance agent. We sat at a pretty table set with yellow and blue dishes and a decanter of white wine. New Age music accompanied our meal, and refreshing breezes drifted in from the garden. The main dish was charquican de cochayuyo, a hearty casserole of potatoes, onions, yellow squash and a sea plant (cochayuyo) that looks like a tangle of long sturdy roots. Exotic to foreigners, it is everyday fare for Chileans. Oty set out a bowl of sliced tomatoes and lettuce, which we spooned onto our plates and seasoned with condiments from the table. Formal salads aren’t common in Chile, I learned. For dessert, she brought us each a small whole papaya in a bowl of syrup. This delicately flavored firm fleshed variety from La Serena is not edible unless cooked. I’ve never seen a papaya like it. After lunch, Oty slipped outside to pluck boldo leaves for a tea that is said to aid digestion. The mild tea was lovely. Before leaving Santiago, I bought boxes of boldo teabags in a Lider supermarket. That’s the one part of Oty’s exotic lunch that I can recreate at home. For personalized tours of Santiago and surroundings, contact Hilda Cerda at hildacerda@hotmail.com. 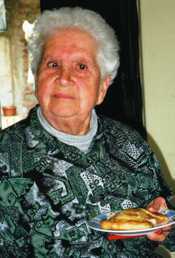 To arrange a meal with Pilar Cerda Espindola, go to http://www.chile-travel.com. Scroll down and click on Oty’s Family Dinners. “It is said that it takes 20 years to acquire enough experience to make truly perfect rice,” wrote Shizuo Tsuji in “Japanese Cooking, a Simple Art” (Kodansha International; $45). Head of the Tsuji Culinary Institute in Osaka, Japan’s top school for cooking professionals, Tsuji wrote the book to introduce Japanese cuisine to the West. That was in 1980, before sushi was as common as tacos in the United States. A timeless classic, it was republished in 2006 without revision. The Japanese reverence for rice is a far cry from the way the average westerner deals with it. Most of us grab a bag off the supermarket shelf, follow directions and hope for the best. We don’t need to know whether it is new or old rice, whether it grew in a flooded paddy or a dry field, whether the climate was dry or hot and humid, what the growing season was like, and where the field was located, all matters of supreme importance to a Japanese connoisseur. When the rice is done, we dish it out without thinking rather than ladling out two precise paddlefuls for each serving, as do the Japanese. And we may eat rice only rarely, whereas to a Japanese, a meal is not complete without it. Despite rituals and refinements, Japanese cuisine is easily accessible, according to Tsuji. There are just two basic seasonings, soy sauce and the fish broth called dashi, and two main requirements, pristine freshness and beauty of presentation. Artful arrangements of a tidbit or two grew out of scarcity rather than pretentiousness. Tolerant and kindly, Tsuji helps westerners take baby steps into what was once an unfamiliar cuisine. “Apart from the intricate knifework of the experts, Japanese recipes are not hard to make,” he wrote, observing that French cuisine is more difficult. 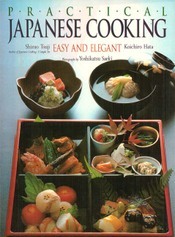 Some recipes may require a trip to a Japanese market, but several require only a few common ingredients. 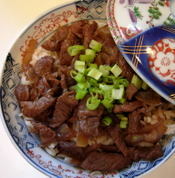 One is a simple beef and rice bowl, based on the dish made popular by Japanese fast food chains. Not too humble for Tusji, it exemplifies the way the Japanese eat—just two ounces of beef to a serving as compared to oversized American portions. Thirty minutes to 1 hour before it is to be cooked, cover the rice with cold tap water and stir quickly with your hands for about 30 seconds, until the water becomes milky. Pour off the water and wash again with fresh tap water. Repeat this procedure until the water is almost clear, then let the rice drain in a colander until ready to cook. Place the rice in a heavy deep pot with a tight lid. Add about twice as much water as rice. Cover and cook over medium high heat until the water just boils. Raise the heat to high and let the water come to a vigorous boil. A white starchy liquid will bubble from under the pot lid. When this bubbling ceases, reduce the heat to low and cook until all the liquid is absorbed. Do not lift the cover off the pot during cooking. Turn off the heat and let the rice stand, covered, 15 to 20 minutes before fluffing with a wooden paddle or spoon, using a sideways cutting motion. Place a kitchen towel under the lid to catch moisture and let stand until ready to serve. Cut the beef slices in 2-inch lengths. Cut the long onions diagonally in 1-inch lengths or slice round onions. Combine the water, soy sauce and mirin to make the sauce. In a large frying pan or wok, heat the oil over high heat. Stir-fry the onions for a few minutes, until soft. Add the beef slices and stir-fry for another minute or so until the meat is no longer red. Add the sauce mixture and continue stir-frying for another minute. Remove from the heat and stir in the ginger juice. To serve, place 1½ to 2 cups rice in individual Japanese bowls with lids or large deep soup bowls. Cover the rice with the beef and onions. Moisten with a few tablespoons of the sauce. Cover and serve immediately. Editor’s notes: The instructions for cooking rice are abbreviated from Tsuji’s more thorough explanation. Tsuji suggested having a butcher slice the beef, or it can be partially frozen, then cut into thin slices. Tsuji squeezed ginger juice directly from finely grated root. Another method is to grind chopped ginger with a small amount of water in a mini food processor. Mirin is Japanese sweet cooking wine. Tsuji suggested substituting 1 teaspoon sugar for each tablespoon of mirin. I can’t imagine anything more enticing than the almond macaroon cookies at Canter’s on Fairfax. The base is a fluted round sugar cookie onto which is swirled an almond macaroon mixture, A circle of luscious apricot or raspberry filling goes in the center. I spotted these in the window as I walked by one day, bought a few, and now I’m a regular customer. Almond macaroon cookies are $1.75 each at the bakery counter of Canter’s restaurant and deli, 419 N. Fairfax Ave., Los Angeles, CA. 90036. Tel: (323) 651-2030. 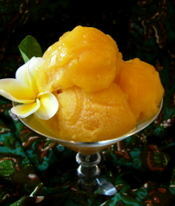 Thanks to Sylvia Tan, I made a heavenly mango sorbet the other day. What makes it unusual is a syrup perfumed with kaffir lime leaves. I came across this idea in Sylvia’s book, “Madder Still About Food” (Times Books International 2002). This is the second of three she has written about her kitchen experiments. The first was “Mad About Food” (Times Books International 1997), named for her column in The Sunday Times, which is the Sunday edition of the Straits Times in Singapore. I have an autographed copy of that book, the result of meeting Sylvia when she came to Los Angeles with her husband, actor Lim Kay Tong. The others I picked up in Singapore. My version of the sorbet is much simpler than Sylvia’s, and the flavor may differ slightly because I use the Mexican mangoes that are available in Los Angeles rather than Asian fruit. Sylvia placed a scoop of the sorbet on a bed of diced papaya, fresh lychees and mango marinated with a little of the syrup, topped this with passion fruit pulp and crushed peanut brittle, then finished off with an almond tuile. “The idea,” she wrote, “is to team the ice with various textures and flavors to get a combination of sweet and tart, richness and crunch.” This is a lovely concept, but not having fresh lychees and passion fruit readily available, I am happy with the delicious sorbet, all by itself. Combine the water, sugar and lime leaves in a saucepan. Bring to a boil, stirring to dissolve the sugar. Remove from the heat, let cool, then refrigerate in a covered container overnight. The next day, cut the mangoes in halves and remove the pulp, working with a serrated spoon or sharp knife. There should be at least 3 cups pulp. Place the mango pulp in a blender container. Remove the kaffir lime leaves from the syrup. Add the syrup and the lime juice to the blender and blend to a smooth puree. Chill the puree several hours or overnight. Turn the mango mixture into an ice cream machine and process according to the manufacturer’s instructions. or turn into one or two shallow pans and place in the freezer. When ice crystals start to form, beat until smooth, then return to the freezer. Beat in this fashion two or three more times as the mixture begins to firm, then freeze completely. Let soften before serving, or place in the microwave for a few seconds. 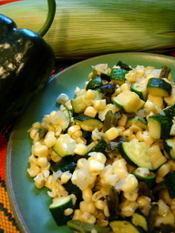 The simplest cooking is often the best, as in this combination of squash, poblano chile and corn. There’s no need to make it more “interesting” by devising elaborate seasonings and a clever presentation. The sweetness of summer’s fresh corn and farmer’s market zucchini is enough. A dash of oregano delicately accents the flavor. Or put in cilantro or nothing at all. And the chile adds just enough heat to provide character. Cut each zucchini in half crosswise, then cut each half lengthwise into quarters. Now cut crosswise into ½-inch cubes. Discard the chile stem and seeds. Cut the chile lengthwise into ¼-inch-wide strips, then crosswise into ½-inch pieces. Heat the butter and oil in a large skillet. Add the onion and garlic and cook until the onion starts to soften, about 3 minutes. Add the zucchini and corn and cook until the zucchini is almost tender, 5 to 6 minutes. Add the poblano chile, the salt and oregano and stir. Cook 2 minutes longer. I eat Mexican food only at places that are genuinely Mexican, not “tourist” spots that figure customers are happy if they get big margaritas, plenty of chips and a bowl of tired salsa. Now there’s an exception. It’s Bloom Café on Pico Boulevard. This informal neighborhood eatery has an eclectic menu that ranges from Mexican through Asian to pizza, along with sandwiches, salads and pasta. I’ve done the Asian (a whole wheat organic soba noodle salad), the pasta (summer artichoke ravioli) and the pizzas (spicy chicken; Provencal; three onions and goat cheese) It was all good, but with my taste for Mexican food, Bloom’s huevos rancheros stand out. Light and fresh (meaning not greasy) these eggs aren’t a bit like huevos rancheros in Mexico. The usual refried beans are missing. So is spicy salsa. 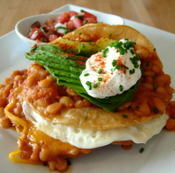 Bloom layers the fried eggs between two crisp corn tortillas. Small white beans in a mild but tasty chili sauce spill over the tortillas, and Cheddar cheese oozes onto the plate in golden rivulets. A thick cluster of avocado slices and a big blob of sour cream sit on top. Salsa, composed of chopped fresh tomatoes, onion and cilantro (no chiles) is in a separate dish. Bloom’s fish tacos are also good. And I once had an artichoke heart salad topped with slabs of ques o fresco (Mexican fresh cheese). A warm goat cheese and sweet corn tamale salad sounds interesting, but I’ll have to go back for that. Bloom is as fresh and pleasant as the food. Flower pots on a counter, big bright flowers painted on the walls, airy space inside and plenty of seating outside make it a happy place to be. 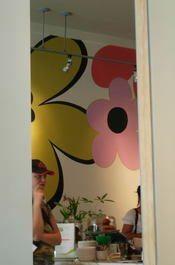 Bloom Café, 5544 W. Pico Blvd., Los Angeles, CA 90019. Tel: (323) 934-6900. Open Monday from 9 a.m. to 5 p.m., Tuesday through Sunday from 9 a.m. to 10 p.m. The other day, I was bored with cooking (yes, it happens, even to the most dedicated of us), but starvation wasn’t an option. It was too hot to walk to the market, and I didn’t feel like driving to a restaurant. So I poked around in the refrigerator to see what could be assembled into something reasonably edible. Ah, fish Veracruz--that was it. An easy, forgiving dish. In Veracruz each restaurant adds its own touch, which gives license to vary the sauce as you please. 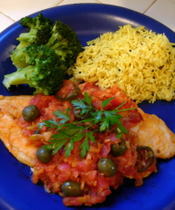 Mine included tomatoes, green onions, garlic, jalapeno chile, green olives from Baja and capers. The Asian markets where I shop carry sticks of flash frozen fish, and I had a couple of these in the freezer. I didn’t even bother to thaw the fish, just sprinkled it with lemon juice and salt and placed it in the sauce to simmer until done. To go with this, I made rice. Plain white rice would have been fine, but I like to get a little fancy as long as it doesn’t take work, so I put in a dash of a powdered condiment for rice that I had bought in Buenos Aires. This colored the rice yellow. And I speckled it with black Indian kalonji seeds. Meanwhile, I steamed some broccoli. And there it was, a fine dinner produced by a bored cook in less than half an hour. Heat the oil in a nonstick skillet. Add the onions and garlic and cook until tender. Add the tomatoes and chile slices and cook 5 minutes. Season to taste with salt, and grind in the pepper. Add the olives and capers and set aside. Remove the fish from the freezer. Allow to thaw or cook frozen. Wash, pat dry and sprinkle with lemon juice and salt. Reheat the sauce. Lay the fish in the sauce and cook until tender, 5 to 12 minutes, depending upon whether the fish is frozen, thawed or fresh. Garnish with parsley. A heat wave is not a bad thing, if you can get to Zacatecas Raspados. Dig into one of this store’s Mexican style snow cones and soon your teeth will ache and your mouth go numb with frozen bliss. Rather than artificial syrups, the raspado toppings are made from fresh fruits such as peaches, strawberries, pineapple, mango and guava. Still more flavors are coconut, nut, vanilla and lime. 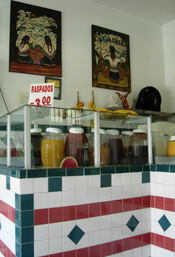 Typical Mexican toppings include tamarind, jamaica (based on a tart, sweet red drink), rompope (similar to eggnog) and cajeta (sweet, caramelized milk). Recently a sign went up advertising a new flavor, coffee. The tiny shop is as Mexican as can be. Reproductions of Diego Rivera calla lily paintings hang on the walls. Red, white and green tiles pay homage to the Mexican flag, and jars of brightly colored toppings stand on the counter, like the colorful drinks displayed in Mexican markets and restaurants. The only place to sit inside is a small bench. When business gets brisk, the shop sets tables and chairs on the sidewalk. Then you’re in the swing of eastside life, as moms and kids, an aged ice cream vendor, auto workers and others pass by. 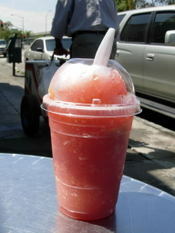 Zacatecas Raspados also sells juices, licuados (blender drinks) and fruit salads, but the raspados have made it famous. So much so that in hot weather, you may have a long wait before you get sweet, frosty relief.